2 Bedroom, 2 Bath, ideal for couples, or families. Fantastic 2 bedroom, 2 bath condo resort. Enjoy the breathtaking view of the Atlantic Ocean from the patio just steps from the white sandy beach. Make sure you head out to the pier each evening at sunset to see picture postcard views. This condo suite is updated with all new furniture and boasts two large bedrooms and two private baths. In the Master Suite, there is a King sized bed along with dresser, night stands, large closet and 40 inch TV. Wake up each morning to the rolling surf just outside your sliding doors to the patio. The Guest Suite has two Twin beds (conversion to King upon request) as well as dresser, night stand, large closet and a 40 inch TV. The living room features a sleeper sofa, recliner, and additional seating as well as a 46 inch TV. Cable is provided as well as Personal Hotspot Internet. The full kitchen has everything you'll need to prepare everything from a romantic gourmet meal, or just Margaritas! There is a washer and dryer located in the unit as well as central air conditioning and remote controlled ceiling fans throughout. This is a very comfortable layout for couples or a family. Relax on your private beach or beside the temperature-controlled swimming pool. Stroll out to our private fishing pier and throw your line in to catch the best fish in the Keys. (fishing gear is provided) Choose your dining pleasure locally at 4 seafood restaurants within .25 miles. You are also within walking distance to multiple charter fishing opportunities and a dive shop to head out and enjoy the water for a day. Casa Clara Resort boasts private tennis courts on-site, and a nine-hole golf course is less than a mile away. Nearly ALL listed activities are within walking/cycling distance from the resort, with a designated bike lane throughout the island for you to walk, run, cycle or rollerblade. Airplane and Helicopter Sightseeing tours located within 1 mile. Power boat rentals are a short walk/bike away. For your pleasure, bicycles are provided during your entire stay!! If you'd like to spend the day sightseeing in the Keys, there are many options to choose from. Key West is only an hour drive to the south. Or head north to the Dolphin Research Center or to Theatre of the Sea where you can enjoy a variety of tours, shows and sea life encounters. In Marathon, daily tours are offered at The Turtle Hospital, Crane Point Natural Hammock, or the Pigeon Key historic site. Suite located steps to the ocean, and boasts 200 foot fishing pier. Yours alone for the entire stay! Locally available. Fishing gear provided. The location was perfect. The pool and pier were just lovely. The condo was very nice. Very well equipped with everything we needed and more. The owner, Robert, was very attentive to our needs. Was quick to respond to our questions. This 2 bedroom condo is perfect! Has all you need to enjoy your stay in Key Colony Beach. Great restaurants with bands and happy hour in walking distance. The best of both worlds right outside your back door with a well maintained pool overlooking the ocean connected to a private peer for those who stay in the condo complex. Key Colony has a tranquil feel to it and is centrally located in Marathon where you have everything you need. You are less than an hour from Key West. The people are friendly and you'll find it easy to park or walk around this area. The Manager, Rob was a pleasure to deal with! Can't wait to go back! We loved the location. Key Colony Beach is a good" Starting-off " for many things to do. With bikes provided, we enjoyed the local sights. We loved the ocean view from the terrace, out our back door, the Under-water Lighted Pier, the beautiful pool. The home was newly decorated, clean, well-appointed and comfortable. We would go back in a "Heartbeat". Would love to stay longer the next time. I would recommend this spot to my friends. So much to do or just relaxing on the sand. Casa Clara was beautiful!! Loved the courtyard with all of the beautiful plants. The condo was super clean with all of the amenities you could ask for. The beach is steps from the property where we could snorkel and fish all day. The salt water pool was so nice after a day at the beach with lounges, umbrellas and tables for relaxing or entertaining your family. Any questions we had, Rob was happy to answer and very helpful with the area and all of its attractions and restaurants. We were pleasantly surprised with amount of things to do in Marathon and the surrounding Keys! We went to Bahia Honda beach which is listed as the most beautiful beach in North America! It did not disappoint!! It was gorgeous! We went on The Marathon Lady and reeled in lots of fish that we brought to the restaurant in town and had delicious fish tacos. Rob provides two bicycles and we rode around Colony Key every morning. There is a really nice golf course within walking distance and at least three restaurants within walking distance as well. We highly recommend this property it was a relaxing vacation in paradise!! Communication about check in could have been better. Owner said anytime after 4p, we arrived at 5:15p and condo property manager had left for the day. There was no note or envelope left for us in the condo office. We called the number on the door and was told our condo was open and keys were on the counter. Condo was clean and living room, dining room is comfortably furnished. Both bedrooms were very nice with wonderful beds/mattresses/linens. Very comfortable. Nice TV's were in living room and each bedroom. To our surprise some pantry items, paper items, toiletries were left for our use. The bathrooms need to be updated. The kitchen is very much in need of an update. The kitchen was adequately but not overly equipped. We had to go to the dollar store and purchase measuring spoons, cheese grater and those aluminum foil pans to use in oven. On a Sunday when the property manager was not there, the air conditioning went out and fans in the dining room/living room also stopped working. My husband was able to locate the breaker and restarted the air conditioning but could not figure out the fans. We did not report because we were leaving on Tuesday and planned to report it at check out, but when we left the property manager was not there. Location, location, location, it was beautiful. 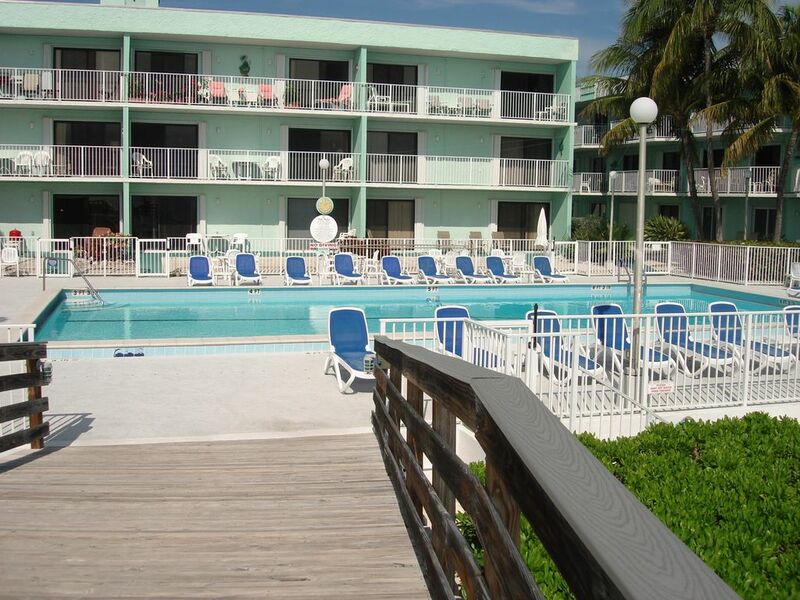 Pool and fishing pier on the beach was great and bottom floor condo was located near both. My biggest disappointment in the condo was the view from within the condo. There was none, the view was the side of the opposite building. The condo is located on the side of the building, ground floor, middle. Even sitting on the patio, view is somewhat limited. I say this only because when booking this condo, I looked at the picture he had of the view "Oceanside" which looked like it was off the balcony from inside the condo. That is not the view from the condo. But saying this, the condo is very close to reaching the pool, beach and fishing pier. This condo is fully equipped with two large bedrooms and two private baths. In the master bedroom, there is a King sized bed along with a dresser, night stands, large closet and 40 inch TV. Wake up each morning to the rolling surf just outside your sliding doors to the patio. The second bedroom has two Twin beds (King conversion available upon request) as well as a dresser, night stand, large closet and a 40 inch TV. The living room boast a sleeper sofa, recliner, and additional seating as well as a 46 inch TV. Cable is provided as well as Internet throughout the complex. The full kitchen has everything you'll need to prepare a romantic gourmet meal or just Margaritas! There is a washer and dryer located in the unit as well as central air conditioning and remote controlled ceiling fans throughout. This is a very comfortable layout for couples or a family.